San Francisco 49ers quarterback Colin Kaepernick reminded us about how difficult the national anthem is. My problems start with how hard it is to sing. I like to think that I sometimes start singing low enough that I can reach “the rockets’ red glare.” Even if this is true, I fear that I’m singing in a different key than the crowds surrounding me. The national anthem for a democracy should be easier for the people to sing. America the Beautiful or This Land is Your Land would work better. Partly because it’s so hard to sing, The Star Spangled Banner ritual often becomes more about performance than anything else. And Americans perform it all the time. Even at city league swim meets, accomplished and/or ambitious young singers carry the melody for the rest of us. Some people bet on whether the performance comes in under two minutes. Others focus on the creativity and competence of the performers. Some focus on whatever event is scheduled to follow, and surely some people think about their country. Mostly, however, we don’t talk about democracy or politics, but just walk through what’s become a rote public ritual on the way to something else. Somewhere along the line, most Americans have picked up on a version of accepted etiquette: stop, stand, salute or cover your heart, take off your hat, and face the flag. But this is America, so there’s lots of variation. People usually applaud, although this really isn’t appropriate; it’s not supposed to be for entertainment. The Constitution is remarkably clear (West Virginia State Board of Education v. Barnette, 1943): government can’t coerce expressions of patriotism. The United States should not be like North Korea. In principle, individuals can consider their feelings about the song, the flag, the country, and their neighbors in figuring out what to do. In real life, the ritual is so common that the two minutes–or so–passes without much reflection or comment. Among the quarterback’s grievances about inequality and structural racism was the failure to prosecute and/or convict police officers who had killed unarmed civilians. It’s hard to think of anything else he could have done that would draw more attention to his cause. And reporters keep coming back to him for clarification and elaboration. A press conference or tweet would never get so much attention. Precisely because the anthem, played before a game or after an Olympic event, has become so routinized and ritualized, any departure from what’s expected can draw disproportionate attention. A disruption of the ritual helps some people realize what the anthem or the pledge means to them. It’s a good way to get attention, but not necessarily to win friends and influence people. At least one fan publicized his burning of a Kaepernick jersey. When Tommie Smith and John Carlos won gold and bronze medals in the 200 meter dash at the 1968 Olympics, they used their moment in the global spotlight to draw attention to racism and inequality. They appeared on the podium without shoes, raising fists covered by the one pair of black gloves they’d brought to the ceremony. 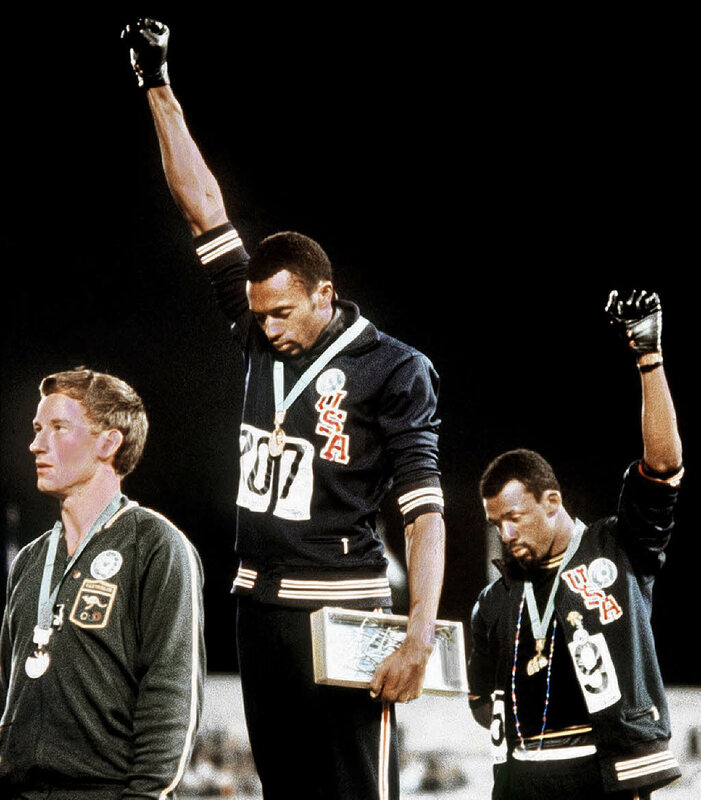 They didn’t have a spare glove for Australian silver medalist, Peter Norman, who donned a human rights badge, and enthusiastically signed onto the cause he was dragged into. The International Olympic Committee banned Smith and Carlos from the games. All three men paid a price in public approbation–but lived long enough to see some vindication for their cause and their commitments. My general rule for evaluating a protest tactic is to look at whether people talk about the cause as much as the tactic. Some politicians, pundits, and players have used the incident as a chance to stand up for the anthem and the flag–and against Kaerpernick, who says he will continue to sit during the anthem. This isn’t very risky–or really, very American. Maybe other players will see their own participation as an opportunity to engage in politics and join in. Maybe the National Football League will weigh in on the anthem with its players, to try to protect its own image. I suspect a few more fans at home will pay a little closer attention to the anthem before the next game to see. It’s also worthwhile for the rest of us to look again at the anthem. We normally sing only the first verse, ignoring the final three, which express satisfaction in the death of escaped slaves. We normally don’t talk about the lyricist, Francis Scott Key, at all. The poet who lionized the “land of the free,” was not only a slaveholder, but a champion of slavery, who as a lawyer argued that the property rights of slave owners trumped the free speech rights of abolitionists. Maybe anything that gets us to look closely at our nation’s inspiring ideals and complicated history is a good thing. Maybe football really belongs on college campuses. This entry was posted in Uncategorized and tagged America the Beautiful, Colin Kaepernick, flag, football, Francis Scott Key, John Carlos, national anthem, Olympics, patriotism, Peter Norman, ritual, San Francisco, Star Spangled Banner, This Land is Your Land, Tommie Smith, West Virginia State Board of Education v. Barnette. Bookmark the permalink.